Friends…When a Soup Dumpling calls, you might as well just give in, because really there is no escape. A Soup dumpling (in Japanese, Shoronpo) or a Xiao Long Bao to be proper, is a pork and crab meatball wrapped in a pleated wrapper of flour dough which is then steamed. The meatball is infused with a solidified ge’lee of broth, so that when it steams, this ge’lee reverts back to soup. When properly made (which is tough as a lot can go wrong! A soup dumpling requires MAXIMUM timing, freshness and technique) the end product hits the pinnacle of taste sensations; silken wrappers, rich soup, delectable meatball. When I first encountered this treat back in the late 90s at the famous Joe’s Shanghai, I went crazy. 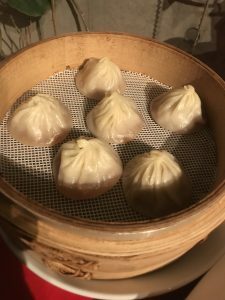 I found myself there at least twice a week with steamer after steamer arriving to fulfill my seemingly unquenchable Xiao Long Bao lust. I became an expert at deftly transporting the delicate dumpling from steamer to spoon without rupturing the delicate skin and losing the soup; I developed a methodology of cooling, adding ginger, red chile, malt vinegar and finally slurping that maximized my enjoyment — a methodology I adhere to and try to extort others to follow. Witness the family of Texans that told me to “mind your own business! We know how to eat!” when I tried to explain the ground rules of soup dumpling etiquette as they were attacking their treasures with forks and losing all the unctuous broth. In short I had a problem, and that problem took me a few years to finally rein it in. Which I did…Barely. The other day I was leaving the Ebisu station when I spied a window full of Chinese steaming baskets — a fair indication that there might be a soup dumpling lurking within. I peered through the window to see an impeccable kitchen chock full of busy workers assembling hundreds of soup dumplings. The next week I returned to Jin Din Rou with my son and daughter to taste these treasures. It was early, but the restaurant was absolutely mobbed. We waited about 20 minutes and were politely asked if we would be okay eating outside. Starving, we acquiesced and were seated at a pleasant, heated table with blankets for our laps. My son is a ferocious eater and as each basket of dumplings arrived, he tore into them with a fury. The dumplings themselves were sublime, but pretty much what I would have gotten in NY, albeit much pricier. The exception was the Ma La Xiao Long Bao and the special XO sauce Xiao Long Bao. The Ma La was basically a pork and crab soup dumpling with the heady addition of Szechuan Peppercorns which added that crazy, numbingly narcotic whoompf. The XO was simply decadent — the meatball itself blended with the rich complexity of home-made, very time-consuming XO sauce and its blend of dried seafoods, onion and garlic — a mind bender of a dumpling. Still in the glow of this dumpling gluttony, I was in Ikebukaro the next day in a kind of little Chinatown. I noted a tiny sliver of a store called Yong Xiang Sheng Jian Guan, with a long line snaking out of it. Photographs of what looked like pan-fried Shanghai buns winked at me from the windows. Not expecting much except to assuage my ongoing dumpling lust, I ordered 6. I have had Shanghai buns before, and delicious as they are, I never ranked them in the pantheon of great dumplings. These were different. In some great triumph of dumpling technology, they had a crunch on the outside that gave way to a pliant, almost bread-like exterior and a throughly soupy interior surrounding a delicious meatball. 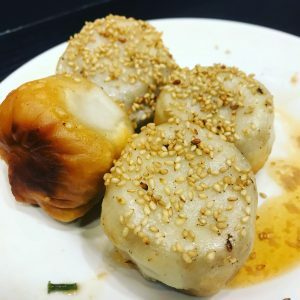 Basically it was a fried Soup Dumpling — sprinkled with toasted sesame seeds and scallion — with thicker walls that somehow did not absorb the liquid: a delicious conundrum that I have never had in NYC.